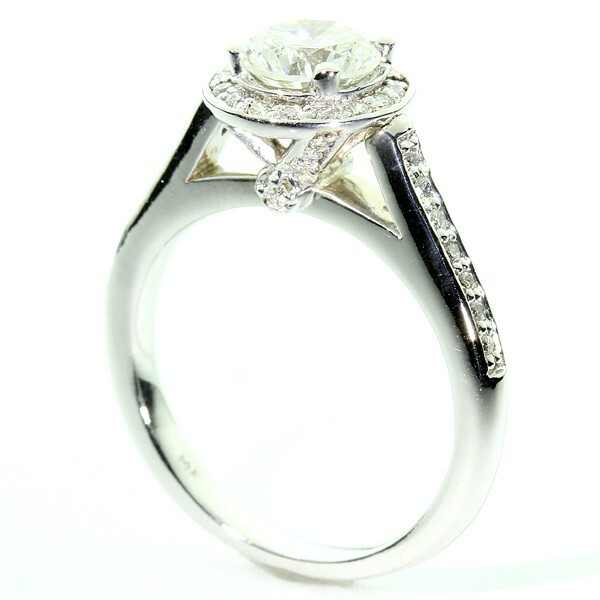 Halo ring is one of the finest and most creative designs that cater to all types of personal styles. Halo rings are called so because they have a center diamond which is surrounded by smaller diamonds creating a halo like appearance. The design is known to create an illusion of a bigger center diamond which makes it one of the most versatile ring styles. Halo engagement rings styles are the newest trend because of their versatility and cost effectiveness. You get so many diamonds on one ring with a big impact look radiating gorgeous style for a cost that isn’t as much an onlooker would expect on seeing the diamond in the center of the ring. So if you are someone looking for subtle sparkle, or someone demanding an amazing style, the halo style rings have you covered. Listed below are top 5 halo engagement rings styles you can choose from. 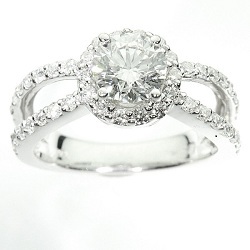 A simple yet elegant style engagement ring is generally a more preferred choice. 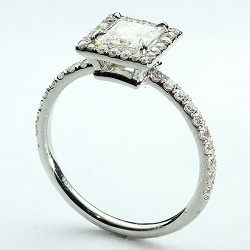 If you have the same liking, then Pave style halo ring makes a good choice for you. 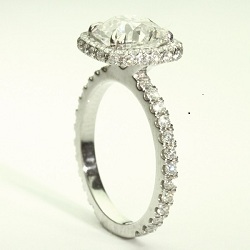 The ring can feature all types of diamond cuts and you can choose the setting you want. Made in fine 14k white gold with highly polished finish, the pave halo ring is available in 4 prongs so you can show off all the diamond in style. The ring sells at $1,350. The Micro pave shank halo has a 3.5mm band, which is split midway from the main center of the ring. The split goes halfway down the ring and you can choose to cover both sides of the split with diamonds. Available in 14K, 18K and Platinum, the ring starting at $1,450 can be customized to fit any finger shape or size. 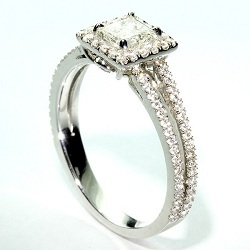 Princess cut diamond used in the thin princess cut halo ring is a good way to cover up slight discrepancies in the diamond, which makes the ring really appealing and slightly less expensive. Selling for a starting price of $1,350, the ring is available in 14K, 18K, or Platinum with 4 Prong. Thin princess cut halo ring has a band which measures only 1.7 MM in width. Similar to the Micro pave shank, the band on the split shank pave is bisected into two down to the half of the ring. Capable of display diamond of any cut or shape in the center; the split shank pave makes room for include as many smaller diamonds as you want. Available in 14K, 18K and Platinum, the ring starts at $1,650. Micro-pave halo swirl is a perfect engagement ring, which features a round diamond in the center. Featuring a band (any metal) 1.5mm thick, the ring can be made in any shape or size. The ring, thanks to the large collection of diamonds it can hold, starts at $2,250. Above are the top 5 Halo Engagement Ring Styles which can make you engagement beyond imagination. Why not you try one from them?